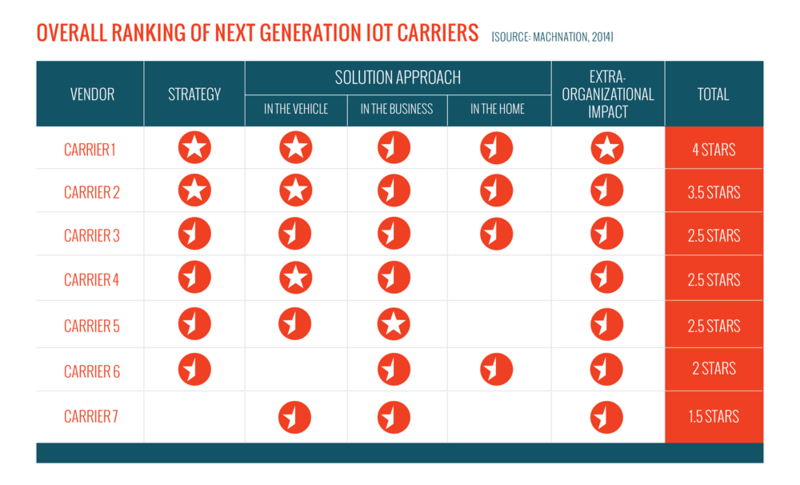 Seven (7) carriers took part in MachNation’s Next Generation IoT Carrier ScoreCard. This newly designed ScoreCard focuses on the impact that carriers will have in the IoT ecosystem: an ecosystem focused on driving IT-based technologies into the operational technology (OT) organizations of public and private sector organizations. MachNation — the only dedicated insight services and application development firm focused exclusively on IoT — has found that machine-to-machine (M2M) is a legacy concept that marginalizes carriers as the broader technology industry redefines the connected enterprise. 2014 is the year of carrier innovation in IoT. Unlike prior years when carriers were generally implementing similar tactics, in 2014 carriers are utilizing different sales channels and approaches; horizontal and vertical segmentation; technology partnerships; acquisitions strategies; retail and wholesale models; and organizational structures. Companies ranked in this ScoreCard include: AT&T, Orange, Sprint, Telecom Italia, Telefónica, Telenor Connexion and Vodafone. Get the Executive Summary for the Next Generation IoT Carrier ScoreCard. Clients access the full report. Learn more about the ways carriers are transforming themselves from an M2M to an IoT world.